This is not an endorsement or recommendation for trolling. If anything, it's simply an explainer to let you know what's going on. Because trolling is bad poi. In Japanese, "poi" (っぽい) means "apparently," "supposedly," "seems like," or even "~ish." It's a pretty common and basic word. But many fans are using it without knowing what it actually means, and you know what, that's okay! The hell does "poi" have to do with anything? I'm glad you asked. The word has quickly become a catchphrase among anime fans outside Japan. In the Kantai Collection (or, if you prefer, Kancolle) anime, which began this past January, the character Yuudachi says the word. A lot. The first time she appeared on screen, she said "poi." The character also uses "poi" in the game. A bunch. And it's been something she's continued to use throughout the show. It's her thing. Some even created "poi counter" for each time Yuudachi says the word in each episode. 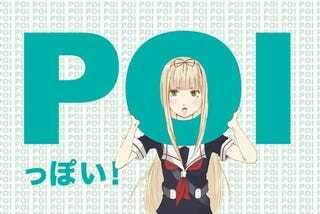 Is there a reason she keeps saying "poi"? Excellent question. Kotaku's in-house nautical anime girl expert Toshi Nakamura, who wrote about Kancolle way back in 2013 (2013! ), explains that her use of vague language is due the differences between the way many Japanese and Westerners view history. Okay. A little context. In Kancolle, the characters are personifications of Japanese battleships (though, there are a few German ships). So Yuudachi is the Shiyatsuyu class destroyer, Yuudachi. In the Japanese account of the ship's final battle, which is far more heroic, the ship went straight through the enemy fleet and flanked them, sinking two American vessels and disabling three more before being disabled. In the Western account, the Yuudachi torpedoed one ship and then was seriously damaged by U.S. gunfire. It was a night battle, and perhaps there was confusion. It seems the character's creators have used this uncertainty to create the "poi" catchphrase. Well, it is war. But the anime is a far more lighthearted fare and not some mopey show. Ditto for this catchphrase, which the anime community has embraced. As evident by the fan art. You mentioned something about trolling? Yes, yes I did. And the trolling, so far, has been harmless, I guess. But perhaps super annoying? It really depends on what your tolerance for this kinda stuff is. According to Twitter users and online forum members, some World of Warships players have been spamming chats with "poi" to the irritation—and confusion—of other players. Since World of Warships is about, well, warships, and Kancolle is about personifications of said ships, then this fits—whether it's wanted is another matter altogether. If you don't like the anime and you're not in on the gag, it sure seems annoying. But the most extreme use of "poi" so far has been the insanity Swiss otaku Melonpan unleashed in this restroom. Melonpan, if you don't remember, once jumped out of an airplane with a hug pillow. How could anyone forget that? I know! It's impossible poi.